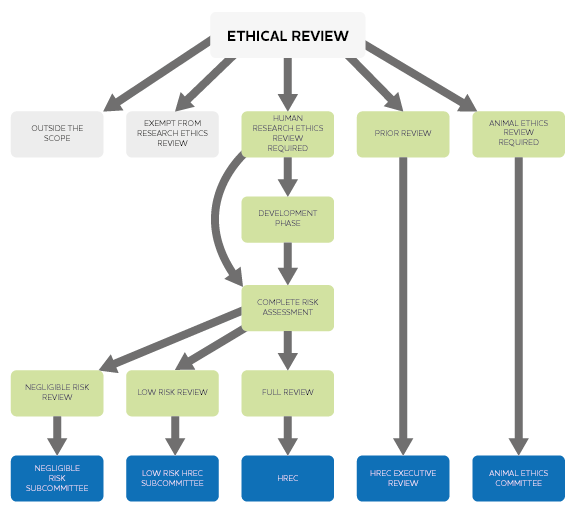 In accordance with the National Statement on Ethical Conduct in Human Research 2007 (updated 2018) and the Australian Code for the Care and Use of Animals for Scientific Purposes and other relevant codes and standards, the University has established a proportional review framework, which matches the process, documentation, length and rigour of the review to the risks and ethical sensitivity of the planned work. All research and research-related activity should be tested in the Proportional Review Checklist (even if you know ethics review is not required). By answering some brief questions about your planned activity, the Checklist will determine whether the activity requires review and the most appropriate review pathway. Alternatively, your project may qualify for an ‘Out of Scope’ or ‘Exempt from Review’ notification. Enter the ECU Research Ethics Management System and complete the Proportional Review Checklist. Please note that REMS is best accessed using Chrome or Firefox browsers. All animal research project must first be checked within the Proportional Review Checklist. If your work requires full animal ethics review you will receive an automated email notifying you of this decision and taken to STREAM where you will complete your application. Visit the applying for animal ethics approval web page for more information, if notified by the Proportional Review Checklist. The first stage of the ethics review process is to complete the Proportional Review Checklist (PRC). The PRC is divided in to seven sections, with each designed to determine whether your project requires review and if it does, the proportional review pathway under which it should be reviewed. For further information on the Proportional Review Checklist, see the Understanding the Proportional Review Checklist web page. My research activity requires review – how do I apply? Once you complete the PRC you will be notified of the appropriate review pathway for your research by email. In this email you will be provided with a link to a Microsoft Team site to facilitate collaboration with your research team in preparing your application, and a link to the application form. You can also access your application form and Team site through your REMS portal . Please see the narrated PowerPoint presentation that shows you how to complete your research ethics application in Microsoft Teams. The Human Research Ethics Committee (HREC) is aware that researchers sometimes need to seek approval for a development phase of their research in order to develop or finalise data collection procedures for research projects. Executive approval for the development phase of the project only can be granted by the Executive Committee of the HREC. This approval is for six months only, and the review process usually takes about a week. If you have chosen to apply for Development Phase approval within the Proportional Review Checklist, you will be sent a link to a Microsoft Team site for collaboration and a link to your application form. Once the application form has been completed, the Chief Investigator should submit his or her application form for review by the Executive of the HREC. No recruitment of participants or data collection can occur before full approval has been granted by the HREC. Once plans for the data collection have been finalised, researchers need to notify the Research Ethics Team they wish to complete the ethics application and a link to the second phase of the Proportional Review Checklist will be sent to the Chief Investigator. for which more than one institution has responsibility for ethical review and approval. The process for seeking approval for a multicentre research project will depend on whether the ECU Ethics Committee is the primary review committee. An application must be submitted for review and approval via the Proportional Review Checklist. Do not choose the option in the PRC that your project has undergone a prior review. Please answer yes to the Prior Review question in the PRC and continue through until you receive an email providing a link to your Microsoft Teams collaboration space and link to the application form. In this brief application form you will be asked to upload the previous approval notification, associated application and any related participant documentation. The application will be reviewed by the HREC Executive Committee. If your project qualifies for review via the Negligible Risk Pathway, you will receive an automated email providing a link to your Microsoft Team collaboration space and a link to your application form. The Negligible Risk application form will also be available via a link in your Team site and your personalised REMS Portal. You may use your Microsoft Team site to collaborate with the other investigators to prepare your application. Please see the helpful information in your Microsoft Team site or this narrated PowerPoint presentation for guidance in completing your application. When completing your application, please remember to upload all relevant attachments such as information letters and consent forms, copies of surveys or data collection instruments and any other relevant documentation to assist reviewers. Once submitted, your application which was deemed to have negligible risk to participants, will be assessed by the Negligible Risk Review Committee of the HREC comprised of the Research Ethics Team and overseen by the HREC chair. A sample application form can be found here. Please note: This is a sample application form only and cannot be saved or submitted. If your project qualifies for review via the Low Risk Pathway, you will receive an automated email providing a link to your Microsoft Team collaboration space and a link to your application form. The Low Risk application form will also be available via a link in your Team site and your personalised REMS Portal. You may use your Microsoft Team site to collaborate with the other investigators to prepare your application. Please see the helpful information in your Microsoft Team site or this narrated PowerPoint presentation for guidance in completing your application. When completing your application, please remember to upload all relevant attachments such as information letters and consent forms, copies of surveys or data collection instruments and any other relevant documentation to assist reviewers. Once submitted your application, which was deemed to be of only a low risk to participants, will be reviewed by your school’s Human Research Ethics Subcommittee. More information on the Subcommittee’s can be found on the Review Committees web page. If your project qualifies for review via the Greater than Low Risk (HREC review) Pathway, you will receive an automated email providing a link to your Microsoft Team collaboration space and a link to your application form. The HREC application form will also be available via a link in your Team site and your personalised REMS Portal. You may use your Microsoft Team site to collaborate with the other investigators to prepare your application. Please see the helpful information in your Microsoft Team site or this narrated PowerPoint presentation for guidance in completing your application. When completing your application, please remember to upload all relevant attachments such as information letters and consent forms, copies of surveys or data collection instruments and any other relevant documentation to assist reviewers. Once submitted your application, which was deemed to involve a greater than low risk to participants, will be reviewed by the Human Research Ethics Committee (HREC). If your work qualifies for review by the Animal Research Ethics Committee, you will be sent an automated email with a link to STREAM to complete your application. For further information about applying for animal ethics applications, visit the Applying for animal ethics approval web page. Your human or animal research ethics application will be reviewed by one of four review committees at ECU. A preliminary review of your application will be conducted by the Research Ethics Team at which time you may be prompted for additional information or attachments. These will need to be uploaded to your Microsoft Team site. Once ready for review, the Research Ethics Team will assign reviewers or add your application to the next HREC meeting agenda (if applicable). At any time, a reviewer or review committee reserve the right to escalate an application for more rigorous review. After the review is complete you will be advised of the outcome of the review and may need to include additional information or make changes to your application. Please make these necessary changes in your Microsoft Team site and return your application for further review. The University Human Research Ethics Committee (HREC) is responsible for the review of human research ethics applications which involve greater than a low risk of harm to human research participants. The HREC will review applications from students and staff whose research qualifies for this review pathway. The HREC meets monthly to consider applications. Download this year’s meeting dates. You can expect feedback on your application one week after the HREC meeting. At this time, you may be required to address some of the committee’s feedback before your project will be approved. Depending on the level of feedback requested, your project may need to be considered at a second meeting of the HREC. For more information about the Human Research Ethics Committee, see the Committee web page. The School HREC Subcommittees have delegated authority to review low risk human research ethics applications for staff and students. For most committees the review will be conducted by two members who will be given two weeks to review and respond to your application. Depending on the level of feedback requested, your project may need to be considered by reviewers for a second time. For more information about the Human Research Ethics Subcommittees, see the Committee web page. The Negligible Risk Subcommittee is comprised of the Research Ethics Team and overseen by the Chair of the Human Research Ethics Committee. This expedited review committee will typically review a negligible risk project within one to two weeks. Depending on the level of feedback requested, your project may need to be considered by reviewers for a second time. For more information about the Negligible Risk Subcommittee, see the Committee web page. The Animal Ethics Committee are responsible for reviewing research applications involving animals, but not invertebrates. Depending on the level of feedback requested, your project may need to be considered at a second meeting of the AEC. For more information about the Animal Ethics Committee, see the Committee web page. You will be notified once your application has been approved via an automated email from the Research Ethics Management System (REMS). Notification of ethics approval will also be sent to other areas where necessary, e.g. Graduate Research School, your supervisor, or the Office of Research and Innovation. All applications are approved with standard conditions of approval and some projects may also have further specific conditions of approval all of which can be found in your approval email. Important: Recruitment of participants and/or data collection cannot commence until notification of ethics approval has been received.